Alas the rumor that winter would somehow escape Southern Ontario has proven decidedly untrue. With temperatures that hurt and snow deep enough to take the gleam off a new shovel we were in bad need of some warmth and comfort. For me, this means baking with familiar ingredients which get turned into much appreciated and quickly-consumed goodies. With an extra package of Skor on hand I received an email early last week from Judy K. of Aberfoyle, Ont. 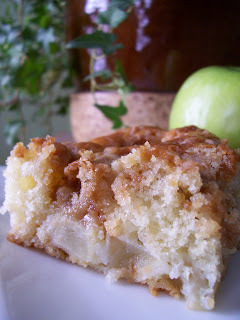 with a recipe for Apple Toffee Cake. Cold day + Skor bits + just-in-time recipe = destiny, no? This coffee cake is fantastic. It is exceptionally moist and buttery (love that Skor!) without being oily at all. The Skor added a warm caramel flavour and the apples added extra texture. Great match. I've had a package of Skor bits in my cupboard for a while now. I was saving them to do something fabulous with, but I just didn't get around to making anything show-stopping. This past weekend, we didn't have anything baked in the house and Mr. CB said, "Boy, a square and some hot tea would be really great right now." I looked at him and he smiled. I went to the kitchen to see what I could do. I picked up the bag of Skor and turned it over. There was a recipe on the back for Skor Bars, or something like that. (I threw away the package and forgot the actual name of the recipe). 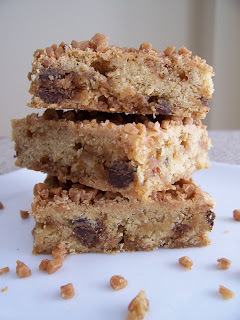 The directions were very simple - a blondie bar batter was mixed up and chocolate chips and Skor bits were added and then baked up. When the bars are done, the remaining Skor are sprinkled on top. You don't want to bake them too long or they will get hard. The bars were tasty and chewy. The addition of the chocolate chips was ingenious otherwise the bar would have been a bit benign. The Skor added some buttery flavour to the bar but the chips added a good punch of sweetness and some character. Also, don't forget to cover them. I left mine out overnight in the pan and they were decidedly drier the next day. Update: The recipe has been posted! A while back I decided to buy a new baking book for myself. As I was looking through the shelves I saw Chocolate & Vanilla, a new book by Gale Gand. I first heard about her from her book Butter Sugar Flour Eggs. I picked it up and perused it while sitting in the children's area. One funny thing was that, as I got halfway through the book, the pages were upside down. I was sure this was a publication error and wondered how it could happen so I went to grab another one. Well, the next one was mixed up too! Slowly, it dawned on me that this book was actually two books in one - Chocolate & Vanilla and Vanilla & Chocolate. I was sold. 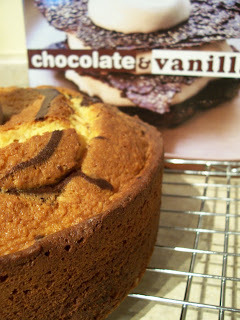 This cake is the second recipe I made from the book and is the perfect countertop sharing cake. It is light but not dry and definitely tastes better the next day. 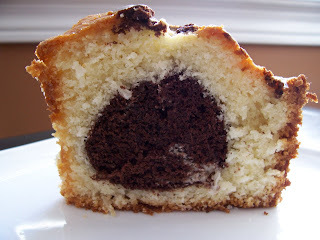 The addition of coconut is light and complementary to the overall cake and the chocolate marble is very intensely chocolate. The cake was well received and tastes very nice with tea and coffee. I've never made gingerbread men before. I would always look at recipes and think that it would be nice to make decorated cookies that looked liked the ones found at coffee shops. It was not until I went shopping with my little neighbour, The Goose, that I was propelled into action. At random intervals during our excursion, he would say "I want gingerbread." These comments weren't directed at me or his mom. It was just a whispered longing of a spicy cookie he tried on a school trip last year. After many failed attempts to placate him, he finally said he wanted to go to Bulk Barn and buy them because he saw them there. That got me listening. He really wanted gingerbread. No way was I letting him eat plastic wrapped cookies! I found a recipe and a cookie cutter and got to work. 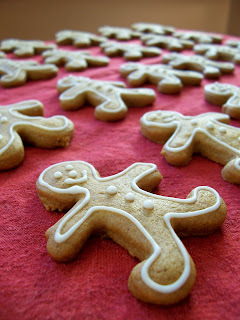 Gingerbread is fantastic. The longer you leave the dough it in the refrigerator the more flavourful it gets. It rolled out beautifully and I made a small army of gingerbread men that was enjoyed all around. The Royal Icing was easy to apply and next year I think I'll use different colours. When I sent them to The Goose he called me back and said excitedly, "I don't like the gingerbread cookies. I LOVE THEM!" That made it all worth it.